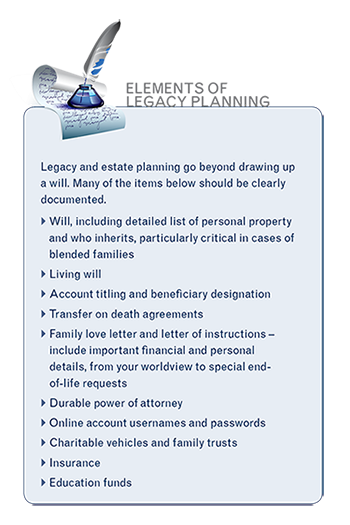 For too many, legacy planning focuses solely on the transfer of money and legal documentation, which generally fall under the estate planning umbrella. While all of that is very important, there should be a more personal aspect to the process. After all, we're talking about your life and how you'll be remembered. Your stories, traditions, beliefs and values need not be taken to the grave. These things make you who you are and should be shared with your children and grandchildren. In the past, loved ones might have inherited a shoebox full of letters and photos that helped tell the story of a life well lived. Today, our digital selves are in the form of Facebook pages, Twitter feeds and blog posts “ hold the personal details of our lives, so it's important to have a plan for digital assets and a way to take control of your life story. There is a practical side to this as well. If heirs don't have access to your email account, they might never uncover assets not listed in your will, assuming you have one. About 64% of Americans don't, according to a 2014 survey conducted for website Rocket Lawyer. The survey also showed 51% of Americans age 55 to 64 don't have wills. Creating an estate plan is particularly important for parents of minor children; property and business owners; those who would prefer to keep money matters private through a revocable trust; and those with a history of poor health. But there are more reasons than ever to have a basic plan in place. A well-drafted will has a number of purposes, including specifying who is in charge of making decisions; outlining the care of any minor children; and minimizing state and federal estate taxes. The ultimate goal, of course, is to make sure your loved ones receive as much of your wealth as possible and have less to deal with during a time of grief. To accompany a formal estate plan, you might also consider writing what's called a family love letter or ethical will. This is the idea of documenting your spiritual and religious beliefs, life philosophy, worldview and wisdom in a video or love letter to your family. Doing so can help you organize your thoughts so you can be sure you've communicated everything you want to share. You might also create a document with instructions related to your online accounts. The American Bar Association recommends naming a digital executor to help sort through your digital life, whether it's a trusted colleague or your computer-savvy daughter. It's also a good idea to provide an inventory of accounts and a means of access. This evolving document should be updated regularly, focusing on the most important digital assets. Creating a lasting legacy is about more than distributing assets to those you love. It's clearly communicating your thoughts, feelings, traditions and values to the next generation. Working with trusted financial, tax and legal advisors can help you ease any confusion or conflict that may arise for your survivors. After all, we want to leave memories of a life well lived, not a tangle of personal debris to wade through.